Lookout Mountain is the most advanced project within Timberline’s 23 square-mile Eureka land package. Timberline acquired Staccato Gold in 2010 because Lookout Mountain (and other Eureka locations) hosts significant oxide gold mineralization amenable to heap-leach processing and has the potential for near-term open pit production with relatively modest capital expenditures. Subsequent drilling and metallurgical results from the project have consistently met or exceeded expectations. Gold ounces in the Measured & Indicated Resource(1) categories increased by 30-percent from the 2012 resource estimate, and are now 78-percent greater than Timberline’s initial 2011 resource estimate. Many of these ounces were upgraded from the Inferred Resource(2) category as the 2012 exploration program concentrated primarily on infill drilling of the existing mineralization. Approximately 84-percent of the resource ounces are from oxide material and 16-percent are from sulfide material. Golder Associates, Inc. completed a scoping-level pit slope evaluation at Lookout Mountain concluding that rock conditions appear favorable for the development of moderately steep to steep pit slopes. Schlumberger, Inc. initiated collection of baseline hydrologic data including installation of three monitoring wells and water quality samples. Kappes Cassiday and Associates continues to perform metallurgical leach studies with planning in progress for program expansion in the current year. Newfields, LLC has delivered a heap leach pad and rock storage area facilities alternatives analysis based on the location of the Lookout Mountain resource. Also, geochemical characterization of mine and waste rock is in progress by InterraLogic, Inc. and Enviroscientists, Inc. is directing environmental baseline studies and developing plans for the upcoming field season. These studies will provide the basis for completion of a Preliminary Economic Assessment (PEA) in the future and, pending favorable results, more detailed investigations will follow in support of a Feasibility Study and submission of a Plan of Operations. The 2012 drill program at Lookout Mountain was successful in demonstrating mineralization continuity and confirming the underlying geologic model while providing material exhibiting positive metallurgical characteristics for low-cost, heap-leach processing. Drill intercepts from outside the defined resource zone continue to provide strong indication that additional drilling along strike will expand the gold resource. Drilling highlights from 2012 include Hole BHSE-152 which intercepted 0.138 opt (4.72 g/t) gold over its final 15 feet (4.6 metres) and was terminated due to ground conditions. This newly discovered zone is below the historical pit at Lookout Mountain where gold was produced in the late 1980s, and establishes that high-grade mineralization occurs down dip of the presently-defined resource. 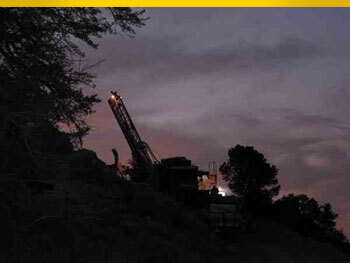 The effective date of the Lookout Mountain gold resources is February 20, 2013. The full MDA Resource Estimate with various cut-off grades can be seen here.